I'm playing at v3.0, all DLCs except Intrigue and ship parts stuff. 1) Even though researched, cannot upgrade the hydroponic farms (as an aquatic race). 2) Some "one per player" buildings are still bugged, with Central Bank I think it's the case since Crusade. Maybe it's somehow linked to conquering another planet with Central Bank, maybe not. 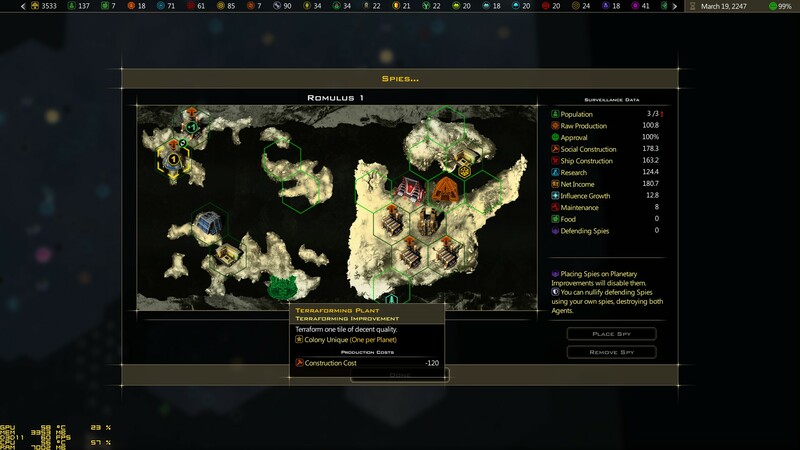 3) I reconquered, then razed and then gave back all the planets the Terran AI lost to the Drengin AI in a war to see how well AI builds (from the scratch). It's doing quite good job (though it's still clearly not as good as human or maybe I don't completely understand it's priorities and planning) except few oddities, so I wanna praise all the improvements you've made to it over the recent patches. Though terraforming a tile with no adjacent tiles is still ungraspable. 4) I suggest modifying the tooltip of Population in the planet screen. It doesn't need to show all the bonuses we have to pop growth which have closely to zero value for any player. It could just show the growth rate and what contributes to your population cap. Because currently the math doesn't add up (unless I omitted something). 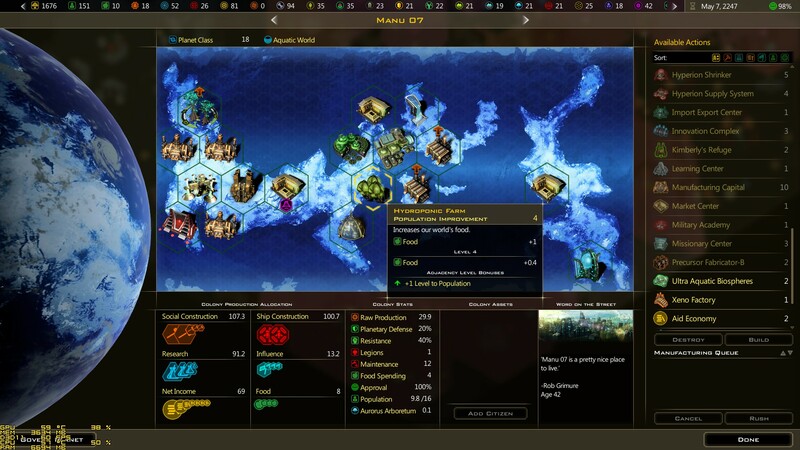 For example I have class 20 planet with Advanced Colony Capital (+5) and level six city (+3 with 150% bonus) which by my calculation goes 5+3*2.5=12.5 yet it is capped at 20 pop. 5) Fifth is little off topic, it isn't about buildings. It's about different race types. 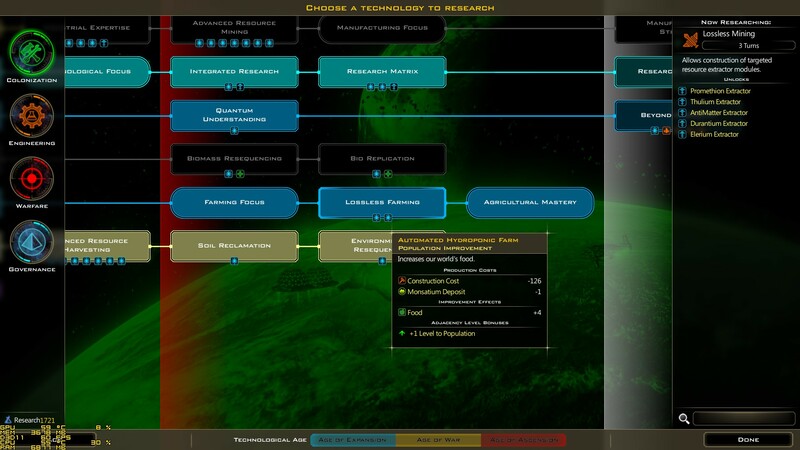 Currently there is no comprehensive info (to my knowledge, sadly https://galciv3.gamepedia.com isn't updated too often by the fans) about bonuses and disadvantages of different life/race types. I don't know what I get and what I lose when I pick let's say silicon based race. I just learned that aquatic is overpowered and have been playing it ever since and nothing else. It can colonize aquatic worlds from the start, its Learning Centers get RAW RESEARCH per adjacency bonus, which is huge boost in early game through mid game (maybe the whole game), each planet gets +1 tile to terraform, it's only race type that has hydroponics which greatly increased its value since v3.0 patch (I don't understand how other spacefaring civilizations aren't familiar with its concept, since it's much more space efficient than conventional farming, which is a thing when you have to feed crew aboard a spaceship - unless you have replicator tech from Star Trek), it also has Hot Springs with adjacency bonus to everything. With so many huge bonuses, I don't know what I'm losing (if anything) compared to other lifeforms to keep the game balanced. 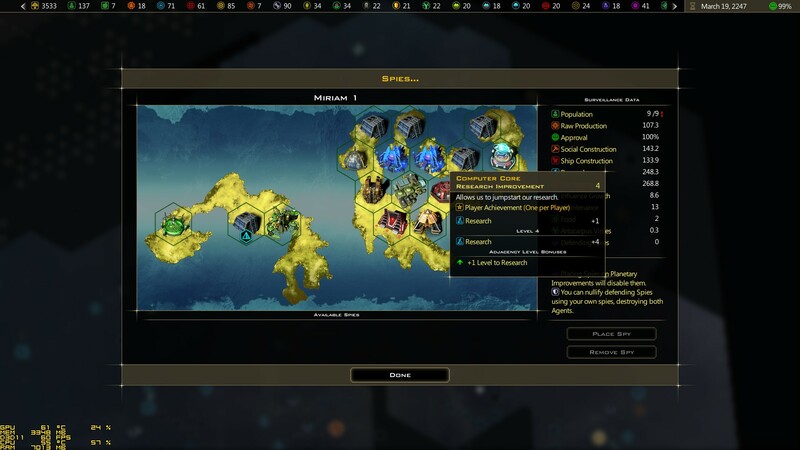 So more comprehensive info about the race types would be greatly appreciated (maybe expanding the tooltips in civ builder or make it clickable to link to dedicated page/screen). To conclude, thank you, keep up the good work and besides adding new content and features, stay still focused on balance issues and AI improvements (I realize they don't bring as much revenue as a new content, but are still core to the game). 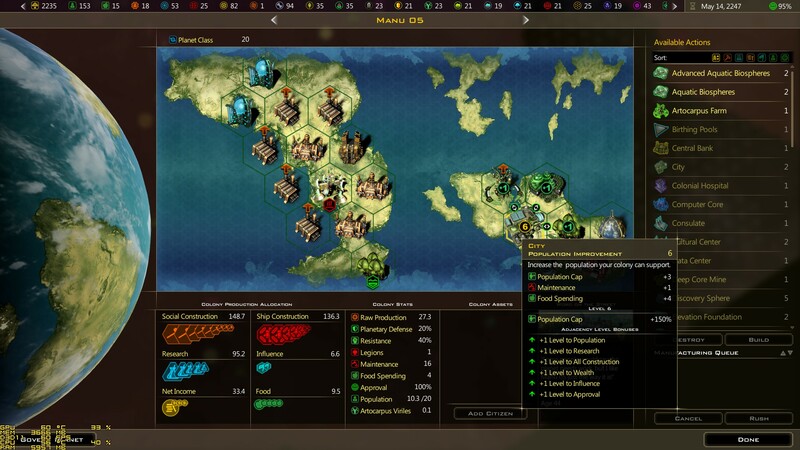 I'm kinda sad that during a war AI still sends fleets incapable of winning to their deaths at me instead of turtling and cumulating ships/techs (or upgrading infrastructure to meet it's production needs for better or more ships). I haven't found anything in the v3.01 changelog which relates to the issues I described here. 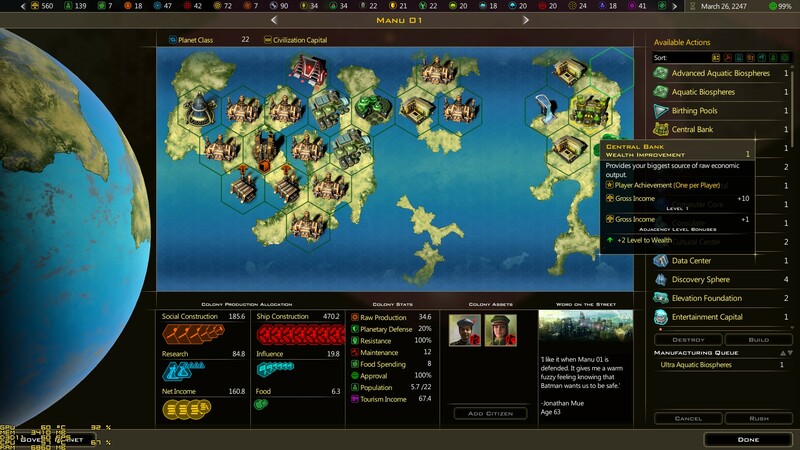 EDIT #1: And how it does work with multiple cities, do their percentage bonuses add or multiply together? Yeah aquatic is vastly superior to standard carbon based life in this game, for many different reasons. The examples you mentioned are a few of them, but not even all of the reasons. I haven't played Intrigue yet though, so not sure what all has changed. Going by SD's normal operating procedure, I figure the game won't be "functional" by my standards for at least another 3 months. So I'll wait for a minimum of 3 months and a couple patches, then a Steam sale, before I try it out. That is not the only building bug that I have noticed in version 3.0 (base game). I cannot build Cultural Centers even after unlocking them on the generic tech tree. Cultural Centers require Harmony Crystals to build. Do you have any Harmony Crystals? Yes, even though I do not see the logic behind that, considering Harmony Crystals are Approval resources. You would think it would be Snuggler Colonies since that provides influence, but I digress. Usually, if it is just a resource problem, it would be greyed out and "Cannot Build: Reason" would be in red in the tooltip; however, cultural improvements do not even show up on the list of available actions for me, let alone worrying about resources. I can still build cultural starbases, though. I just checked in a fix for upgrading hydroponic farms. Thank you for letting us know.